It’s a bit of a tricky thing with all these unheard gems from somebodies archives that nowadays see the light of the day (in form of a proper release). Sometimes it’s like a gift from the gods (like John Coltranes incredible Both Directions at Once), sometimes it’s not the best record but still interesting for one reason or another and sometimes the reasons why the record hasn’t appeared long since are obvious. 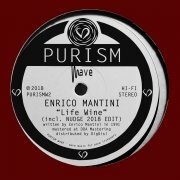 Life Wine, Enrico Mantinis deep Deep House track, dates from 1991 and is, you’ll learn in an instant, definitely worth the release. The overall mood is light-hearted, the genre- (and era-) typical piano chords uplifting and the Mediterranean synth cascades soaked with warm euphoria. Unmistakably Italian (not to say Italo), you might call it music for sunrises but still the beats are punchy and driving and it is definitely for and about dancing, not hanging out in a beach chair. Life Wine comes as a perfect example for those tracks that are in a way the usual stuff, no sound experiments you’ve never heard before, no new structures that reinvent it all, but for sure there’s a magic about them, cause it’s just the right groove, the right atmosphere and the right elements that kick it. And of course Mantini did it all on purpose as his later hits such as What U Want prove. Today the innocence and ingenuousness that has been such an important part of this music and era shows even more and fuels the emotional power Life Wine generates. Claustrophobic, sinister and hauntingly introspective? No, this is just the opposite! The 2018 Edit by Bologna duo Nudge does what an edit is supposed to do: sharpen it all a little, make it a little tighter (in this case mainly by reducing the synths) and more functional but keep the originals spirit alive. A timeless pleasure, you can’t go wrong with it.